A person going to a book store to purchase his first Bible may get overwhelmed by the selection. Over the years I have reviewed quite a few, including a number of New King James Versions of the Bible, I have kept many and given away even more. But, each of these Bible translations offers something very unique and the Thomas Nelson’s NKJV KNOW THE WORD STUDY BIBLE is no different. So let’s break it down. 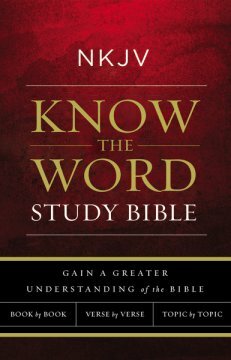 What does the NKJV KNOW THE WORD STUDY BIBLE have to offer? Book Summary: This is just a sentence or two that let’s the reader know what to expect. How to Study: This section, found at the beginning of each book helps the reader prepare by presenting questions to ask and things to look for. Topical Articles: There are certain concepts / beliefs that are basic to Christianity. These subjects are shared by presenting 5- 6 Biblical references in which the reader can review for himself. For example: The Trinity is presented in Genesis, Deuteronomy, Matthew, John and Galatians. Commentary: At the bottom of each page are notes, commentaries of a particular verse or word. Something pretty standard in many study Bibles. Cross References: Cross reverences are included at the bottom of the page along with the comments where necessary. There is not a section specifically dedicated to references. Concordance and Maps: The standard concordance and maps are included. Also presented at the back of the book are information regarding- money, weight and measurements. Just as important as the content is readability. The font size is good and the words of Christ are in red. In this world of more than one style of Bible I recommend NKJV KNOW THE WORD STUDY BIBLE, particularly if you are doing a topical study on the basics of faith.